MANILA – Miss Philippines Catriona Gray took home the crown as the Miss Universe 2018, with an inspiring win but she was not the only one who inspired on this day. Another Miss Universe contestant went viral for being an inspiring person after it was revealed that she worked as nanny and domestic helper to support her studies before becoming a beauty queen. The young lady’s humble beginnings and struggles were announced by the host during the preliminary competition last December 13 at Impact Arena, Bangkok, Thailand. 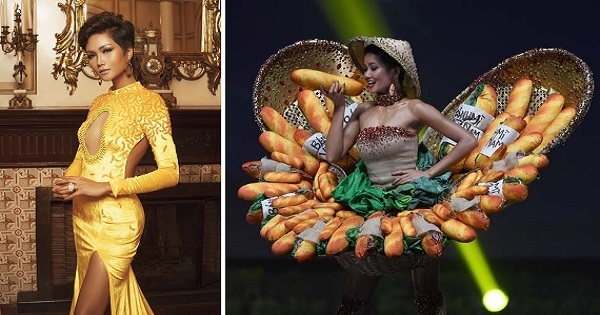 “This 26-year-old Finance major served as a nanny, serving food and cleaning houses to go to college,” he announced, as Miss Vietnam H’Hen Nie sashayed on the catwalk in her impressive yellow gown. Revealed to be the first and only Miss Vietnam to come from an ethnic minority, H’Hen graduated from her Business Finance studies at the College of Foreign Economic Relations in Ho Chi Minh City, Vietnam. But her road to success was not easy. Coming from the Rade tribe, H’Hen was supposed to get married at an early age and start a family, as was tradition. But the young lady decided that such a life was not for her. Instead, she insisted on going to school and completing her education. Because her family had no means to send her to college, H’Hen decided to work as domestic helper to support herself. She washed dishes, cleaned houses, took care of kids, served food, and served her employers; but this did not stop her from working hard in school to fulfill her dreams. While an intern at a bank, she became a model. This gave her a better pay and helped her complete her studies. After graduation, the young lady was discovered by a Vietnamese designer and would soon become a famous face in the country after competing in “Vietnam’s Next Top Model”. H’Hen is proud of her previous job as a nanny and domestic helper – and such would also be her inspiration to help others in need after she was given the chance to do it. When she won as Miss Universe Vietnam in 2017, this inspiring young lady used the entire $10,000 cash prize for scholarships in the schools in her hometown! Isn’t that amazing? She may have not won the Miss Universe 2018 crown but she did win a lot of hearts with her inspiring story!